The lead characters of Nelson's The Guardship are back in this intelligent tale of high seas adventure: landowner and swashbuckling former seaman Thomas Marlowe; his wife, Elizabeth; and his friend, former tutor Francis Bickerstaff. Though Marlowe is but recently settled in 1702 Tidewater Virginia, he has already won the enmity of many colonists--and particularly Frederick Dunmore, a Bostonian of murky origins--by freeing his slaves. As the novel opens, Marlowe is planning to set out to sea. Once he is granted an official letter of marque, he will be able to legally plunder merchant ships hailing from countries hostile to England in Europe's monarchical wars. 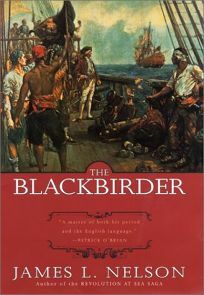 But then King James, Marlowe's chief freedman and good friend, kills a slave ship's captain in a brawl, and flees for Africa in the slave ship itself, the eponymous Blackbirder. Dunmore forces the royal governor to withhold Marlowe's letter of marque until he's captured King James, and so Marlowe and Bickerstaff give chase, dreading the inevitable encounter with their friend. A fair amount of high seas action leads to a scene of final bloody treachery in Africa. Almost everybody here has a secret: Marlowe, formerly Malachias Barrett, is an ex-pirate; Elizabeth was once a London prostitute; Dunmore is haunted by what may be murder; King James is shadowed by a sinister ex-slave. Though a few anachronisms slip in (Marlowe ""hadn't a clue what was going on""), the period atmosphere is a bit thin and a couple of events strain credibility (with six shots Elizabeth kills six men), on the whole this is a creditable adventure tale, deepened by Nelson's unusually detailed and nuanced account of the slave trade. (Mar. 1) Forecast: Darker, less polished and more contemporary in tone than Patrick O'Brian's Aubrey/Maturin series, Marlowe's adventures will either strike O'Brian fans as rough stuff or refreshing fare. But even wary traditionalists may be won over by this superior installment.